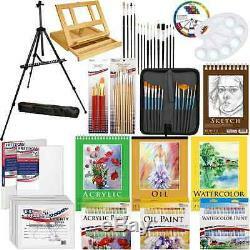 US Art Supply 133pc Deluxe Artist Painting Set with Aluminum and Wood Easels, Paint and Accessories. BLACK PISMO Lightweight Aluminum Field Easel with Adjustable Legs & Easy turn adjustable knobs for quick height & angle adjustments & Solana Adjustable Wood Desk Easel with Drawer. 24- 12ml Acrylic Paint Tubes, 24-12ml Oil Paint Tubes & 24-12ml Watercolor Paint Tubes, 10-Well Plastic Palette, & 4 Color Mixing Wheel. 7 Piece Nylon Hair Brush Set, 12 Piece Nylon Hair Short Blue Handle Oil/Acrylic Brush Set & 15 Piece Multipurpose Brush Set. 9" x 12" Spiral Binding Acrylic Painting Pad 400Gsm, 12 Sheets, 9" x 12" Oil Painting Pad 190Gsm, 15 Sheets, 9" x 12" Heavy-Weight Watercolor Pad 300Gsm, 12 Sheets, 5.5" x 8.5" Spiral Binding Sketch Pad 160Gsm, 30 Sheets. 8" x 10" Professional Quality Canvas Panels 6 Pack, 11" x 14" Professional Quality Stretched Canvas 2 Pack. 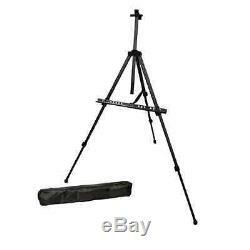 US Art Supply BLACK PISMO 65 Tall Lightweight Aluminum Field Easel - Great for Table-Top or Floor Use - FREE CARRY BAG. Spring Loaded Top Clamp secures canvases in place. Folds to only 22 for storage into small spaces and for transporting. Accommodates canvas art up to 32 high. US Art Supply Solana Adjustable Wood Desk Easel with Storage Drawer. Has a drawer with three compartments to hold brushes, and other essential gear. 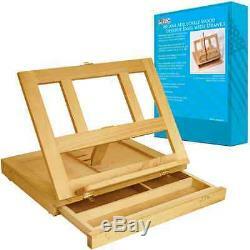 The easel incline adjusts to four positions and will accommodate a canvas up to 11" x 14". Accommodates canvas art and prints up to 11 x 14 inches. Adjusts to four different positions. 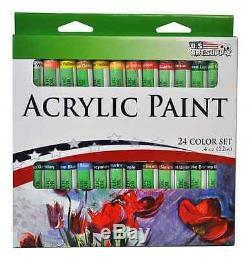 Art Supply 12ml Acrylic Paint Tubes 24-Colors. High quality pigments offer smooth consistency, a satin finish, and an excellent covering strength. Highly versatile paints for use on a variety of surfaces such as wood, canvas, fabric and more! Conforms to ASTM D4236; Safe for educational use, Non-Toxic and Non-Leaded. Art Supply 12ml Oil Paint Tubes 24-Colors. Oil color has a long open time which permits the artist to blend colors and glaze over a long period of time. Modifications can easily be made to the work as it develops whilst the color is wet. Art Supply 12ml Watercolor Paint Tubes 24-Colors. Extremely Heavyweight and Versatile Paper made for the Acrylic Artist. Nice Texture and Resistant to Moisture Blead Through. US Art Supply 9" x 12" Oil Painting Pad 190Gsm, 15 Sheets. Acid Free, Neutral pH, Natural White Sheets, Glue Bound for Easy Removal. Standard Weight and Versatile Paper made for the Oil Painting Artist. Designed to Hold Up Well with All Oil Paints and Mixed Media Uses. US Art Supply 9" x 12" Heavy-Weight Watercolor Pad 300Gsm, 12 Sheets. Acid Free, Neutral pH, Cold Press Surface, Natural White Sheets. Heavy Weight Paper Surface for Mastering Watercolors Techniques with Wet Media. Excellent Paper for Wet Painting with Water Colors and Mixed Media Uses. US Art Supply 5.5" x 8.5" Spiral Binding Sketch Pad 160Gsm, 30 Sheets. Heavy Weight and Versatile Semi-Textured Paper made to Accept all Mixed Media. Ideal for Writing, Drawing & Sketching. Use with Pens, Markers, Pencils and more. US Art Supply 8" x 10" Professional Quality Canvas Panels 6 Pack. 100% Pure Cotton Artist Canvas mounted onto Acid Free Heavy Board. Triple Acrylic Gesso Primed for Oil or Acrylic Painting. 8-Ounce Finished Weight with Turned Edges. Acid Free - Archival Quality - For All types of Media. Great for Students and Professional Artists, use for Kids Crafts and all Decorative Painting Projects & more. US Art Supply 11 X 14 Inch Professional Quality Acid-Free Stretched Canvas 2-Pack - 3/4 Profile 12 Ounce Primed Gesso - (1 Full Case of 2 Single Canvases). Ideal for use with all acrylics, oils and other painting media. 3/4 inch Profile - Hand stretched over kiln-dried stretcher bars. Triple primed with acid-free acrylic gesso. Back stapled with staple-free edges. Unprimed Weight 7oz - Primed Weight 12oz. US Art Supply 8 X 10 inch Professional Quality Acid Free Canvas Panels 6-Pack - Great for Students and Professional Artists (1 Full Case of 6 Single Canvas Panels). 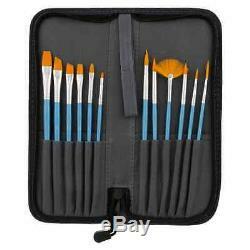 US Art Supply 12-Piece Short Handle Nylon Hair Artist Paint Brush Set Blue Handle with Carry Case. Short Handle Brushes with Nylon Hair & Carry Case. 12 Piece Assorted Artist Brushes for Acrylic & Oil Painting. 1-Line Brush #1, 1-Fan Brush #4, 1-Fiber Brush #6, 2-Angle Brushes #8 & #10, 4-Round Brushes #2, #3, #5, #6, 3-Flat Head Brushes #2, #6, #12. US Art Supply 10-Piece Artist Brush Set. #1, #5, #7, #9, #11, #12, #10, #8, #6, # 2. US Art Supply 15 Piece Multi-Purpose Brush Set. For Acrylic, Oil, Watercolor & Gouache Painting. 11 Short Handle Brushes - #1, #2, #3, #4 & #5 Pony Round, #1, #3 & #5 Bristle Round; 1/2" Bristle Flat, 1/4" & 1/2 Pony Flat. 4 Long Handle Brushes - 2 Pony Round; 4 Pony Flat, 4 & 8 Bristle Flat. 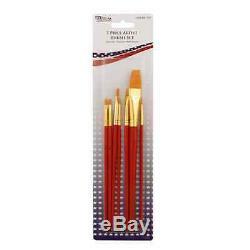 US Art Supply Golden Taklon 7-Piece Nylon Hair Artist Paint Brush Set. 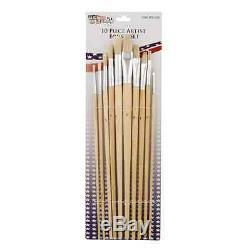 Set of 7 Short Handle Artist Brushes. 1-each Wash 3/4, 1-each Flat Shader #2, 1-each Flat Shader #6, 1-each Round #2. 1-each Round #4, 1-each Liner #2/0, 1-each Flat Angular Shader #1/4. The item "US Art Supply 133pc Deluxe Artist Painting Set with Aluminum and Wood Easels, Pa" is in sale since Wednesday, November 30, 2016. This item is in the category "Crafts\Art Supplies\Drawing & Lettering Supplies\Other Drawing Supplies". The seller is "discountkingpin" and is located in Avenel, New Jersey. This item can be shipped to United States.